Preliminary testing of Apple's latest A-series mobile Application Processor shows that it brings a big jump in general CPU performance over last year's already speedy A8. It also advances Apple's lead in proprietary ARM core design performance over Samsung and Qualcomm. Compared to last year's iPhone 6 Plus, the new iPhone 6s and 6s Plus deliver Geekbench scores that are more than 50 percent faster at multicore operations and nearly 60 percent faster in single core tasks. Single core benchmarks best reflect the performance users are likely to actually experience, because most apps can only effectively take advantage of a single core most of the time. Games and other processor intensive tasks may be able use multiple cores at once, but its rare to find circumstances where the system and real apps fully utilize all available cores in the way artificial benchmarks (specifically designed to measure multicore performance) can. Multicore performance on higher end Android devices is often far higher than their listed single core performance, in part because Samsung and Qualcomm have relied on adding multiple cores (four or even eight) to support the slower performance of smaller, individual cores. Apple's A9 is only only faster than the K1, but efficient enough to power even the smaller of Apple's two new iPhone 6s models. At the same time, the A9 delivers single core performance that makes Apple's entry level iPhone 6s over 90 percent faster than Samsung's fastest Exynos 7 chip used in its premium-priced, limited availability Galaxy S6 Edge. 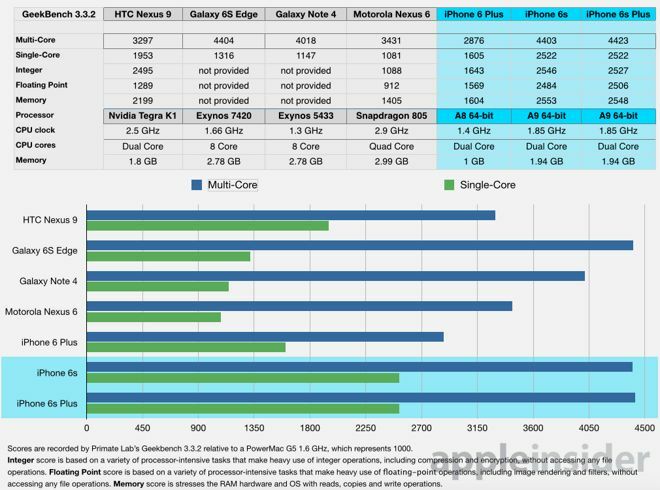 Apple's A9-powered iPhone 6s lineup is also over 133 faster in single core performance than Qualcomm's quad core Snapdragon 805 used in Motorola's Nexus 6, despite that phone being clocked faster and bundling in an additional GB of system RAM. And with just two cores in its is A9 design, Apple can even edge past the combined processing power of Samsung's "eight cores" in benchmarks; the new A9's two cores are also significantly faster than all four cores in Qualcomm's 805, even when running synthetic, multi-core optimized benchmarks. In July, we noted that GameBench reported--after extensive testing of last year's iPhone 6 against this year's flagships from Samsung, HTC and Motorola--that in games, Apple's iOS devices were not only performance competitive but simply faster and delivered better looking graphics, despite packing less RAM and fewer "cores." In part, that's because "iPhone games use around a quarter of the RAM of the Android games we tested," as the site observed. Android has been shown to poorly utilize available resources for years now, erasing the purported advantage of higher clock speeds, more RAM and more processor cores touted by Android enthusiasts. More relevant to iPhone users, the new iPhone 6s and 6s Plus deliver a tangible performance increase that makes apps launch faster and load and render data faster, as shown in our hands on app launching clip. Other performance enhancements on the new iPhone 6s line include faster new Touch ID, which now handles fingerprint login and Apple Pay almost instantaneously.